D. Gaertner, K. Abrahams, J. Kottke, V. Esin, I. Steinbach, G. Wilde, S. V. Divinski, . Combined radiotracer- and interdiffusion measurement and simulation in CoCrFeMnNi high-entropy alloy. The diffusion kinetics in a CoCrFeMnNi high entropy alloy is investigated by a combined radiotracer-interdiffusion experiment applied to a pseudo-binary Co15Cr20Fe20Mn20Ni25/ Co25Cr20Fe20Mn20Ni15 couple. As a result, the composition-dependent tracer diffusion coefficients of Co, Cr, Fe and Mn are determined. The elements are characterized by significantly different diffusion rates, with Mn being the fastest element and Co being the slowest one. The elements having originally equiatomic concentration through the diffusion couple are found to reveal up-hill diffusion, especially Cr and Mn. The atomic mobility of Co seems to follow a S-shaped concentration dependence along the diffusion path. The experimentally measured kinetic data are checked against the existing CALPHAD-type databases. 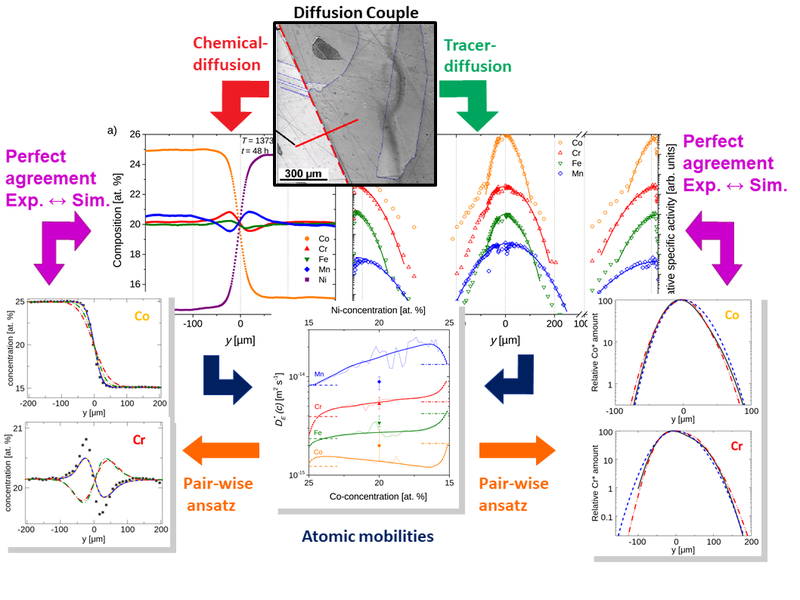 In order to ensure a consistent treatment of tracer and chemical diffusion a generalized symmetrized continuum approach for multi-component interdiffusion is proposed. Both, tracer and chemical diffusion concentration profiles are simulated and compared to the measurements. By using the measured tracer diffusion coefficients the chemical profiles can be described, almost perfectly, including up-hill diffusion.